One of the interesting things about being in the age of social media is that the walls between athletes and the media who cover them on a daily basis simply don’t exist anymore. So when someone tweets out a controversial take about an athlete, it’s not a surprise to see an athlete hit back anymore. 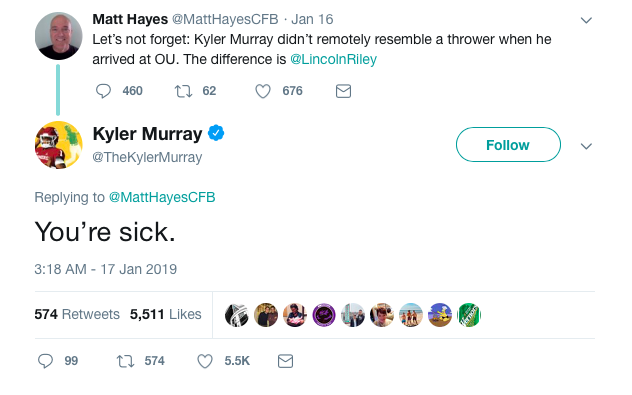 That happened on Twitter this week when college football writer Matt Hayes threw out his opinion that Lincoln Riley deserved all the credit for turning Kyler Murray into a Heisman winner and potential first round NFL Draft pick. Judging by Hayes’ other tweets, he may just seem to be a really big fan of Lincoln Riley. For his part, Murray has only tweeted four times this year so this tweet must have really got his attention. Totally dissing Murray’s role in becoming not just an elite quarterback, but a Heisman winner, is probably a little harsh. It’s not like Murray was a slouch and a nobody before he came to Oklahoma, either. 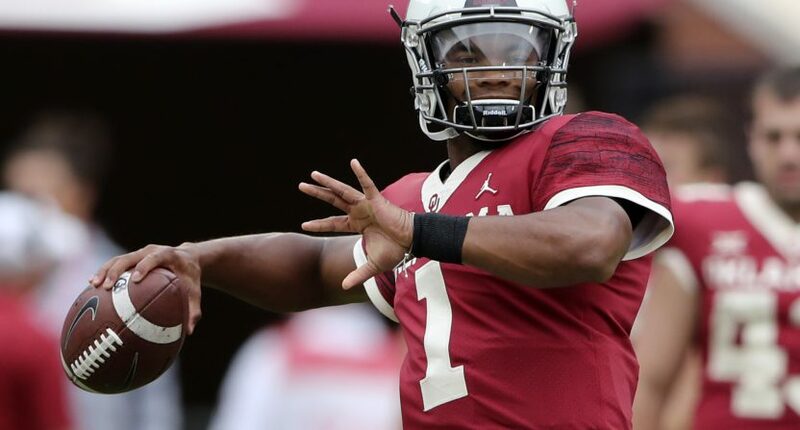 He was a five-star recruit coming into college and the top rated dual-threat quarterback in his class. Although his numbers during his freshman season at Texas A&M didn’t exactly light the world on fire, it’s not like the downfall of Kevin Sumlin’s program was somehow his fault. Yes, Riley has a great resumé when it comes to developing quarterbacks, especially those who transferred in like Murray and Baker Mayfield. But we’re talking about one of the most unique and gifted athletes in a generation with someone who could be a first round draft pick in the NFL and in Major League Baseball. He’s probably pretty secure in his attributes as an athlete and quarterback. And a little extra motivation probably won’t hurt his future prospects.